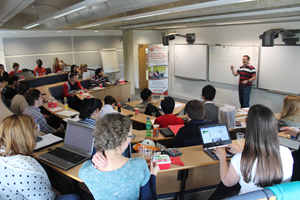 Supported and sponsored by Santander and hosted by the Henley Centre for Entrepreneurship the PopUp Business School delivered the ‘Summer Start-up Boot Camp’ at the Henley Business School during the week 27 June – 1 July 2016. This was the fourth annual Summer Start-Up Boot Camp and again it was fully subscribed with a record number of students and alumni attending the course. The course dispelled the traditional approach to starting a business. It bust the view that you need money to start a business. Today you can start a business with a good idea, robust customer insights, investment of time and a tablet or PC. Participants learnt how to start a business with no money, build a website for free, find customers and start to make sales. It also showed how to use social media to build visibility and scale the business. The course was punctuated by many practical exercises designed to enhance learning of the key messages among them how to be persistent in selling and win customers. Described as incredibly interactive, fast paced and fun the exercises brought participants together in a way that also helped build their confidence and energy levels. Amazing! was the unanimous verdict of participants on the course who reported their confidence had been raised significantly with many planning to continue developing their business idea and pursuing a career as an entrepreneur.